In many cases restoring the PC back to a previous date is simply a matter of restoring and then re-booting to complete the restore of files that were open and could not be replaced. 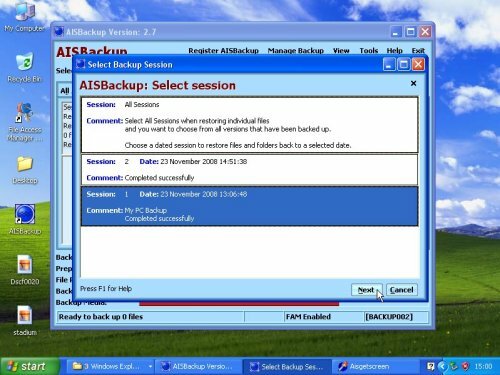 If there have been major changes to the Windows Operating system between that state now and the backup session you wish to restore then you should see Restoring using the AISBackup Restore CD here. 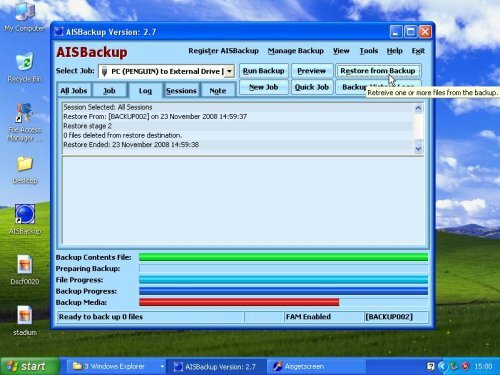 AISBackup will suggest which restore method to use at run time. In this example we are restoring a PC back to an hour ago as the last game demo we installed was appalling. Start AISBackup and then click Restore from Backup.